I know the first thing you have to say, or one of the first things. What is the difference between this version of Cinderella and the animated one? Well to start, it is live action. But that is only the most obvious difference visually. Otherwise, there are many great differences between the two. 1. First, or second, however you’re keeping count, the character development in this film is farrr greater than the animated version. Not only does the film start from Cinderella’s childhood, but we meet Cinderella’s mother and father (for more than a minute – Yayyyyy!) as well as her horrible step mother and step sisters. In addition to this, this film makes it a point to correct a misconception: Cinderella is a nickname, her name is actually Ella. Ella’s bratty step sisters come up with this clever but cruel nickname after Ella falls asleep in front of the fireplace and wakes up with ashes on her face the morning after. Get it? Cinder–Ella? I don’t like it either after knowing what it resulted from, but I guess her and Disney stuck with it. 2. Kenneth Branagh’s version of Cinderella focused way more on people than mice, so kudos to him and Chris Weitz (writer of the screenplay) for that at least! While I loved the animated version of Cinderella, it seems many people, especially the makers of CinemaSins, were not fond of the usage of the mice in the animated Disney version. Branagh fully fleshes out the evil step mother and it could be said that he redeems her character slightly when he reveals the cause of her wicked ways. As cliche as it is, before marrying Ella’s dad and making Ella her personal slave, she lost the love of her life, thus she became cruel and bitter. 3. The Stepmother or Lady Tremaine, has a personality and is not just in bed all day! Yay! Yes, all of that is completely necessary lol. As a lover of clothes, it was sometimes hard to hate the step mother especially when she is played by the lovely Cate Blanchett. But then she opens her mouth again. Although Tremaine never lays a hand directly on Ella, she is extremely emotionally abusive towards Ella and treats her as subhuman, if that. She mentions time and time again how Ella is nothing more than a servant girl, and every time she says it, it has more of an impact on Ella’s self-worth. That’s where I’ll end the discussion of those girls. Besides my enhanced love for her dress, and the fact that her Fairy God Mother is played by Helena Bonham Carter, the differences between this version and past ones could be considered small. 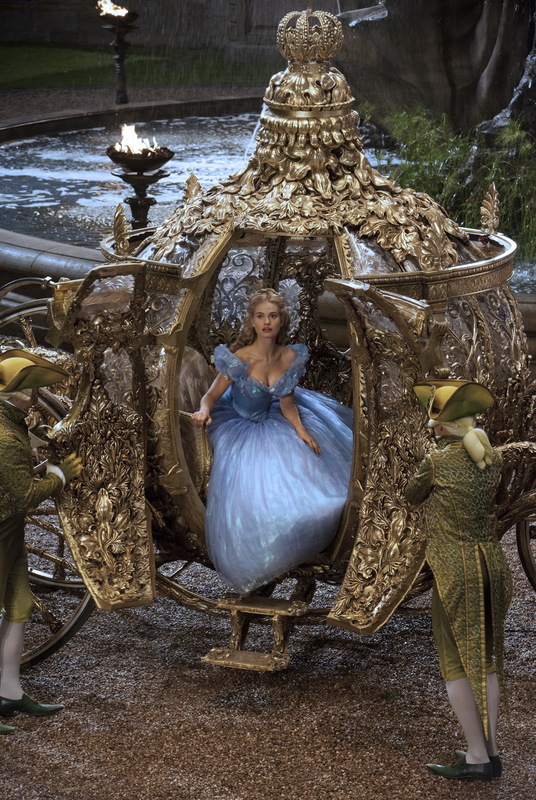 A hint of the Grimm’s Brother’s Aschenputtel (German Cinderella) is present when we first see the fairy godmother. She first appears as if she grew into a really dry and brown tree. She is hunched over with her head facing downward until Ella requires her assistance. In their first meeting, the Fairy Godmother asks for some milk and Ella appeases her request as if someone randomly appearing by her door is a normal occurrence. Oh Disney. There are less bippity-boppity-boo’s. I recall only one. Maximum two. 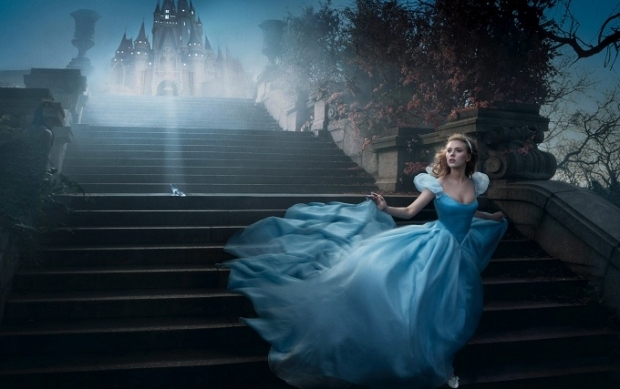 We all know Ella drops one of her glass slippers while running down the steps to her carriage. The time it takes her to get to her carriage and half way home seems like the longest minute of my life. I thought the spell broke at 12 Disney, not at 12:01. But I forgive Disney even though technically they could have stretched their logic even further to allow Ella to make it home dry from the ball. Instead, she walks the rest of the way home in the rain. Cinderella still gets Prince Charming in the end, even after the deal Lady Tremaine makes with the Grand Duke. Cindy has the pipes that force everyone to listen: when she sings, she makes people swoon. Gus Gus gets Ella’s attic window open just in time for the prince’s helpers to hear Cindy sing her song. The Prince orders Lady Tremaine to let the girl -he still does not know her name- out of the attic.